Firstly, I have no skin in the game here and like you I rely on good feedback to make informed decisions. For guys looking for a little more than what their current 991.2 Sport Exhaust offers, the Speedtech exhaust fits the bill perfectly. 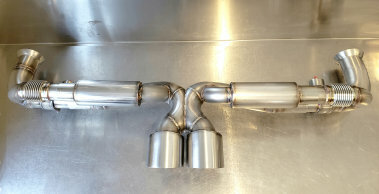 As John has such a great reputation in the business when he asked me if I wanted to be the R&D test mule for the design of his 991.2 exhaust system, I jumped at the opportunity with the condition that after he designed it, he would just upgrade my cats to his custom hand made 'high flow' versions and put my stock PSE back in the car. However, after going down for some testing on Saturday I was quickly turned into a believer. Before posting, I wanted to sleep on it and give it an extra day, as being able to give unbiased feedback is important. After going out again this morning with my wife I am loving the Speedtech exhaust even more! It gives the car a more exotic aggressive tone mixed with some more pronounced and fantastically intoxicating turbo spool sound. Another great part of the system is it is valve operated just like the stock PSE and can be dialed down when putting the car in normal mode. I would say the quiet mode with the Speedtech exhaust is comparable to the stock PSE in 'Sport Mode' just has a bit more exotic tone. The Sport Mode is a level above that, but it did pass the true test-my wife thought it sounded really good(and I had it in the louder mode the whole time). The other benefit worth noting is the car feels more responsive and overall faster. John(who owns a boosted up 996 Turbo) couldn't believe how unbelievably fast the car was. Having been there and then watching the posted video I can tell you that the video doesn't do the system the justice it deserves. Really well done. Thumbs up Speedtech! Thank you John and Chad. The Speed Technologies 991.2 Switch-X Exhaust System is designed to provide an improved exhaust note for the discerning Porsche enthusiast that desires a tastefully louder, slightly more aggressive, non-restrictive high performance exhaust. It is a very high quality, domestically produced, lightweight exhaust with no baffles or restrictions whatsoever, designed and manufactured in the USA by our team of professionals. 1) Our OEM replacement Hi-Flow 200cpi HJS German catalytic converter substrate cores are welded to custom end cones to replicate the factory mounting points. This allows them to used with either our Switch-X Pipe or the OEM center muffler. Our catalytic converters replace the OEM units and have the same heat shield mounting points integral to their design. They also feature "two outlets per cone" for maximum flow, just like the OEM design. 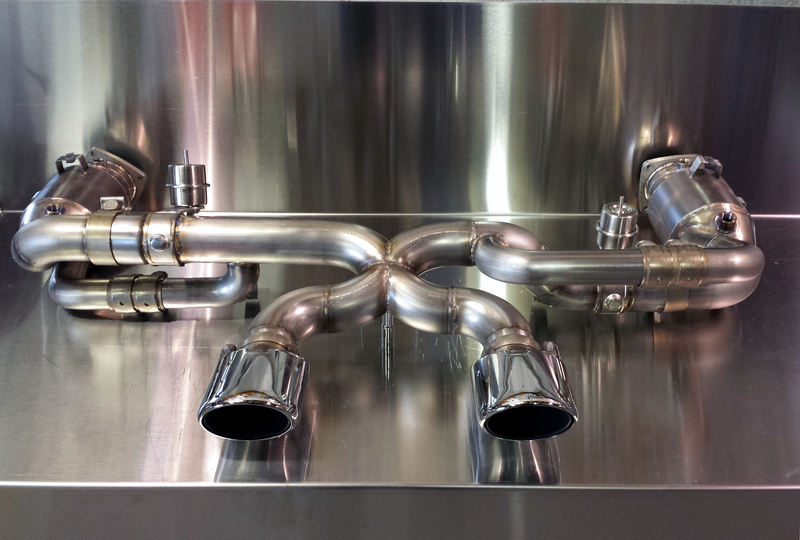 2) A center muffler delete X-Pipe which is designed to be used with the OEM cats or out Hi-Flow catalytic converters. It is fabricated to fit the OEM tips or any other brand/style of tips that are compatible with the OEM exhaust. Both the converters and the X-Pipe are very simple bolt-on components and use all OEM hardware for installation. They can be used either as singular plug and play components with the OEM exhaust sections or in unison as a complete SpeedTech Hi Performance Exhaust System. We utilize 100% T304 stainless steel construction throughout and achieve perfect fit to OEM components. This system is a truly superb upgrade for a 991.2 PSE equipped car. The sound is very tastefully upgraded and the hi-flow cats enable faster turbo response, additional power and a fantastic sport sound improvement. The X-Pipe tweaks the sound to a very pleasant, exotic tuned tone. We have designed this system for PSE cars where "improved sound and performance" is the goal. There is a video link below. 991.2 - I went with a Speedtech 100 cell cat cross pipe setup. The car has been tuned and the last part was the exhaust. The increase in power is noticeable and dramatic. The sound is perfect and no drone as the EP setup emitted. The spooling is quicker and the pull is greatly increased. No complaints here. What I liked is that the parts were made there, not overseas. I had great Customer service from the guys and the install was easy. Remove and replace. My old tips from the EP exhaust were too big, so I went with the Speedtech tips. The sound is perfect and I am very satisfied with the product and the purchase.